The Polk County Genealogical Society was established in 1994 in Bolivar, Missouri. Interested parties first met for an organizational meeting in February 1994. The first program and business meeting was held in April 1994. At the time, the society was a special interest group of the Friends of the Polk County Library and was supported financially by the Friends. The first name of the society was the Bolivar Genealogy Group, but the name was soon changed to the Polk County Genealogical Society. In 1996, the society became independent of the Friends of the Library. The first publication for sale by the society was published in 1998. The society was incorporated in August 1999 and became a not-for-profit corporation in January 2001. In October 2001, PCGS purchased the Carnegie library building located on the town square of Bolivar, Missouri and completed renovation of the ground floor in the summer of 2002. The Polk County Genealogical Society Library was opened to the public in July 2002. In January 2003, PCGS received a grant from the Delarue Trust to remodel the top floor of the PCGS Library. Work commenced in the spring of 2003. The PCGS Library building was declared a historic site by the National Park Service on July 17, 2003 and is now listed on the National Register of Historic Places. It was the first historic site in Polk County to be listed on the Register. In 2007, restoration of the outside of the historic building commenced. Pictures of the before and after are located on "Library" page (link to left). The project for 2009 was replacing the outside stairs. (Pictures can be found on the same page.) 2010 project was replacing the windows, starting with the north side windows. This project was completed in January 2010, thanks to many generous donations. Since then, several grants and donations have been received, allowing PCGS to upgrade all of its computers, scanners and printers plus making aesthetic improvements to the interior of the building. In 2016 the group embarked on a new adventure--the installation of solar panels on the roof of the building. This improvement has saved the society thousands of dollars in utility bills! PCGS currently has over 70 publications for sale and publishes a 10-page bi-monthly newsletter. Membership in PCGS numbers over 200 people. The PCGS Library and Research Facility, open four days a week, is operated totally by volunteers. The Polk County Genealogical Society will get $4,928 to provide supplies for preservation of historical records. Missouri Secretary of State Matt Blunt announced June 8 that the organization, located in the old Carnegie library building on the southeast corner of the Bolivar square, had been approved for the Missouri Historical Records Grant program award. The grant program was created in 2001 through a $300,000 appropriation by the Missouri legislature and matching funds from an arm of the National Archives. Secretary Blunt said, "History is our shared public memory. It is important that appropriate funding be made available in order to preserve these historical treasures for future generations to learn from and enjoy." Susan Sparks, president of the PCGS, said the funds will be used to buy acid-free boxes and file folders, Mylar to encapsulate old documents, and other supplies for the preservation of records. Documents in the care of the PCGS include maps, land deeds, marriage certificates, court records, photographs, Civil War discharge papers, church records and others, some dating to the founding of Polk County in 1835. The PCGS was established in 1994 under the auspices of the Friends of the Library. In 2000 the society was incorporated as an independent, non-profit organization. In 2001 the society bought the Carnegie library building at a cost of $90,000. Community support raised $140,000 that was used to buy the building and remodel the first floor. Renovations are now underway on the upper floor of the former Polk County library building, funded by a $32,000 grant from the Delarue Trust. In July 2003 the building also became the first structure in Polk County to be listed on the National Register of Historic Places. The society has about 200 members. Polk County Genealogical Society President Susan Sparks and Leta Gass, archivist and treasurer, attended the Friends of the Missouri State Archives annual meeting June 14 to receive the Jonas Viles Award. 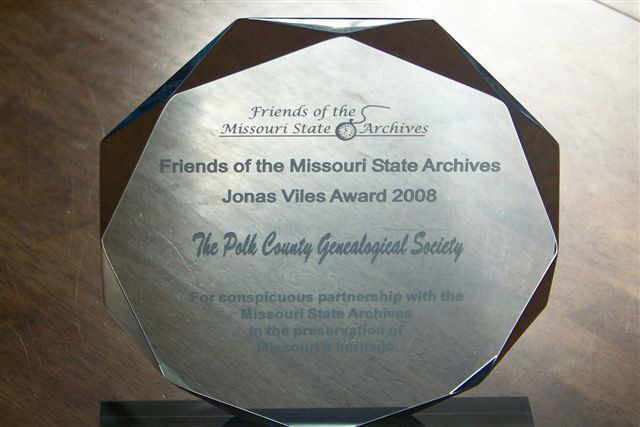 Polk County Genealogical Society received the Jonas Viles Award presented in June by the Friends of the Missouri State Archives. Viles was a University of Missouri history professor who rescued thousands of documents from the capitol lawn after the 1911 fire. One institution or person who has made a significant contribution to the preservation of Missouri’s heritage is chosen each year for the award, with the first award being given in 2004. The recipient must be a strong supporter of Missouri history; possess a deep commitment to its preservation and study; and have made a positive impact on the safekeeping, accessibility, scholarship, and/or promotion of Missouri’s past. “I want them to see the award and know we take preserving history and genealogy seriously,” Sparks said. “For a totally volunteer-supported organization, it is an honor,” Gass said.